self-styled cask whisperer jim mcewan, a man who could confidently be described (as we say north of the border) as having the gift of the gab, retired some 18 months ago as master distiller at bruichladdich distillery. originally an apprentice cooper at bowmore distillery, he rose through the ranks to become manager, before moving across the loch to take charge at bruichladdich when messrs. coughlin and reynier rescued it from its mothballed status at the end of last century. the man is revered throughout the whisky industry. if evidence of the latter were needed, his masterclasses held each may at bruichladdich's open day during the annual whisky festival, were regularly sold out months in advance. He once proclaimed that distillery managers were the rockstars of the 21st century, the veracity of which you'd be more than well aware if you were in any way associated with islay's distilleries. however, just like frank sinatra, jim mcewan's retirement was short-lived. 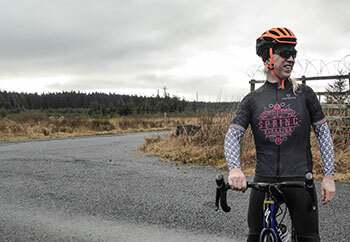 As if eight malt whisky distilleries on one island were not enough, glasgow's hunter laing have purchased land from islay estates at ardnahoe, around half-way along the singletrack road to bunnahabhain to build a ninth. and lo and behold, the aforementioned mr mcewan has surfaced as a distillery consultant to hunter laing, perhaps an astute move on their part, but time will tell. however, the press release that accompanied this announcement featured all the rhetoric and hyperbole for which both jim and the whisky industry is famed. the site of the new distillery is, in fact, particularly picturesque, overlooking as it does the sound of islay, the paps of jura and north to colonsay and the isle of mull. though apart from a few years in glasgow, mr mcewan is an islay lad born and bred, yet professed "...when i visited the distillery site... it absolutely blew me awayÓ, despite having travelled the road on more than just a few occasions during his time of island residence. but then, just to move things one stage too far, he claimed "it felt as if the sarrs were aligned." i would therefore like to adopt some of this verbal and philosophical superfluity in the telling of my weekend tale involving weather, bicycles and apparel. at the time of writing, there are a but a few days until 'proper' cycle racing commences at omloop het nieuwsblad, closely followed a day later by kuurne-brussels-kuurne. at that particular point, we have entered the period dearly beloved by cycle fans the world over, known as 'the spring classics' a particular genre of one day events that includes milan-sanremo, ronde van vlaanderen, paris-roubaix and several other iconic events. not only do several of the aforementioned demand closer attention to the model of bicycle being ridden, but the terrain over which they are raced and the traditional european late february/early march weather provide a certain 'je ne sais quoi' totally absent from the grand tours. 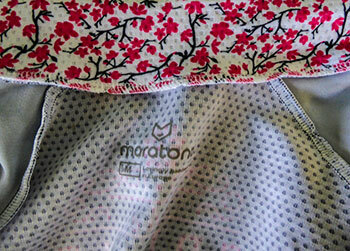 maratona cycle clothing is relatively new on the uk market, currently offering a compact and bijou range of men's and women's jerseys and shorts featuring an intriguing range of designs, the most notable of which (in my opinion) is their spring classics jersey reviewed here. in common with james mcewan,it seemed as though the stars had aligned in my favour when the jersey was augmented by a brand new specialized roubaix and particularly inclement weather, necessitating the wearing of a showers pass waterproof jacket. 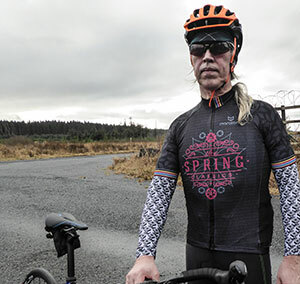 it is, i believe, a pertinent fact that hebridean temperatures at the end of february preclude the al fresco wearing of a short-sleeve cycle jersey, even for a swift 80km around the estates. underline that fact with persistent rain and you will perhaps forgive my accompanying said maratona jersey with a pair of armwarmers covered by the showers pass jacket. however, this is something of an occupational hazard at this time of year and scarcely impinges upon the efficacy of any jersey review under these conditions. in fact, itÕs possible that so doing gives it a harder time than would otherwise have been the case. it is nice to see that the new kids on the block have adopted that to which we have become accustomed. aside from a most welcome full-length front zip, the three capacious rear pockets have been augmented by the all but compulsory fourth zipped security pocket. however, where this italian made jersey really scores is the detailing: a camlock ykk zip with attendant zip garage at the top, close fitting sleeves and a highly breathable fabric that did its level best to cope with being stuck under a waterproof jacket for most of its first day out. the decor, which, on a technical jersey probably ought to be the least of your considerations, is quite magnificent. 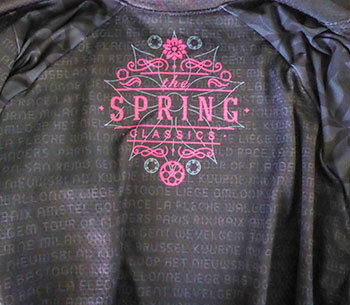 aside from the bright pink design paying testament to the spring classics, the names of the pertinent races are subtly included as a background pattern on the jersey body, contrasting nicely with the leaves design seen on the sleeves, the latter being bordered by a striking set of coloured hoops. the principal design feature is repeated in smaller format on the back, though i fear its presence was likely mostly obliterated by my ponytail. much as i'd love to have adopted a tom boonen stance and ridden sleevelessly hard all day, i am too much of a wimp to be included on anyone's spring classics roster. however, divested of outerwear in the process of froth supping and toastie munching, the jersey did attract favourable comments from those usually too distinterested to comment. my subsequent verbal dissertation on the joys of omloop, dwars door vlaanderen and the importance of cobbles in day to day life probably left them wishing they hadn't. 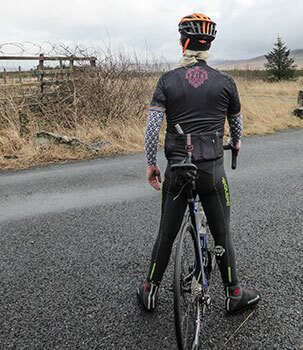 in what has become something of an overcrowded cycle clothing market, it's nice to see a new company with at least a smidgeon of creativity and originality and one that appears to have hit the ground running. the medium-sized jersey reviewed is available for a most amenable £65 in sizes ranging from small all the way up to xxl. 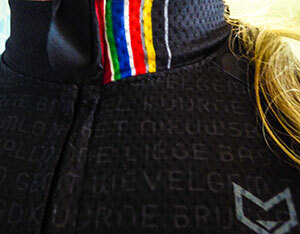 if you're really quick you could have one in time for omloop and kbk this weekend.